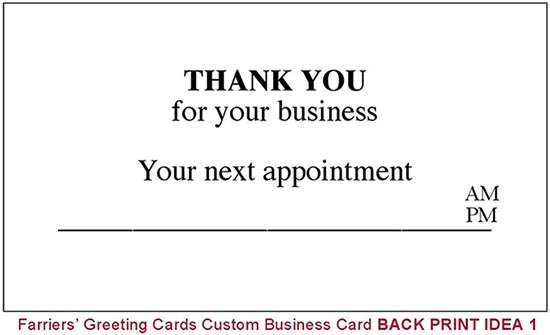 Make your custom business card even more memorable! ADD A BACK PRINT - select from the dozens of pre-designed idea choices above, or submit your own info - you'll receive a proof via email to review and approve before your card goes to print. Back prints are optional. Many farriers use this area to write the next appointment. If you have policies regarding scheduling, payment etc., you may want to include them on your card. The back is also a good place for a humorous or uplifting quote or verse. Be sure and give the author credit. If you don't know the author, put author unknown -- not doing so implies that you wrote it. If you have your own logo, that can be printed on the back in black ink only. This can help to coordinate your new cards with other forms you may already be using. Cost for back print is $12.00 per box.